There are many public holidays in Japan in late April to early May. If you add weekends to 29 April, 3, 4, 5 May, holidays last strait for almost one week. So it is called Golden Week. Music, dances, performances and discounts are everywhere to attract people in Golden Week. 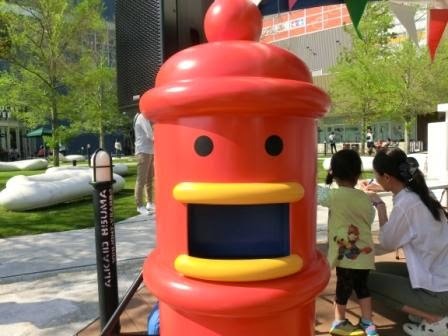 LaLaport Toyosu, a shopping center in the cool bay side district of Odaiba, had a lot of events. Lego, musicians, penguins, anime songs, Gachapin, craft people, wrestlers, super heroes, etc, came. Ferries around Odaiba stop at LaLaport Toyosu, so many people come here although it is not located at the center of Odaiba district. 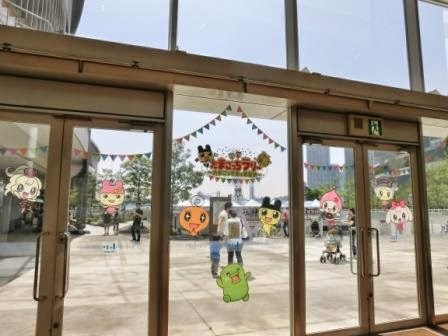 One of the events was this tamagotchi event on 2 & 3 May. 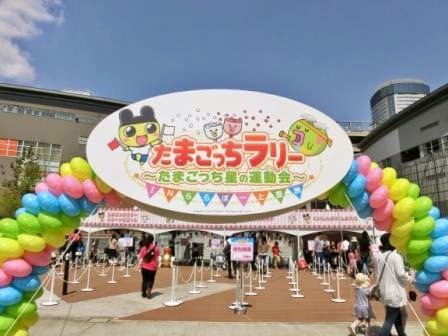 I’ve reported Tamagotchi Anniversary Event in Odaiba last November, and again the tamagotchi event was held in Odaiba in spring. …It’s about my hobbies, so I’m excited whichever you are interested or not! 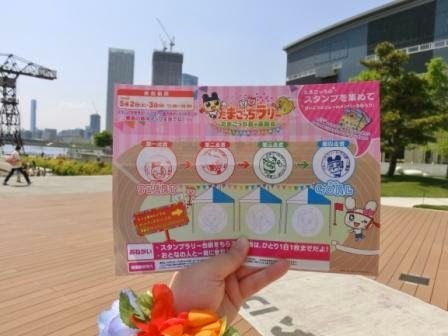 The event is titled Sports Day on Tamagotchi Planet. Some schools (including my elementary, junior high and high school) hold a sports day in the season of fresh green in Japan. So tamagotchis were so fresh in spring! There were some stages. Team Red and Team White of tamagotchis enjoy the sports day. Team White won! 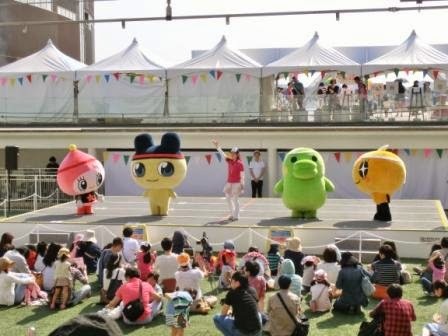 After the stage performance, children took photos with tamagotchis. I was so surprised that the designs of LaLaport Toyosu were so cool. The building features ships and decks. I used to believe that Omotesando Hills in Harajuku is the coolest shopping center in Japan, but I learned that there are some competitors! The inside was light, modern and had many shops. I don’t think it is a shopping center that is on every guidebook, but it must be an interesting place. 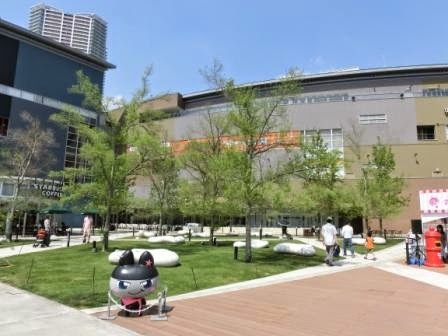 Actually, part of Tsukiji Market is going to move Toyosu, so LaLaport Toyosu may become well-known more or less. I feel it’s cool enough! I got the notebook and collected tamagotchi stamps all around the shopping center. When I collect all, I can get an original sticker. I posted Bandai’s survey into this. Cute, isn’t it? I wrote my favorite tamagotchi is Mimitchi. I hope Mimitchi will appear more! 5 May is Children’s Day in Japan. That’s why many things were for children and I saw a lot of tamagotchi-loving children jumping and laughing. I am a grownup now, but I feel that it is refreshing to go back to my childhood. 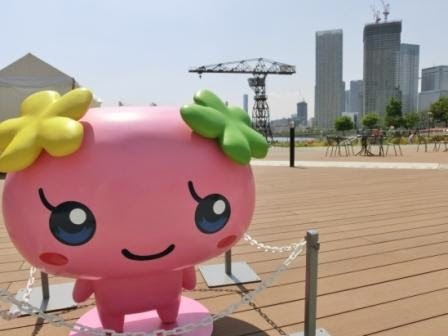 Love kawaii characters, love tamagotchi!